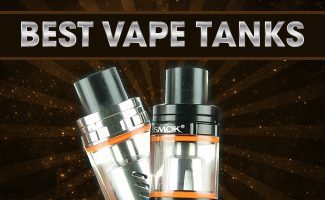 Are you new to the vaping world and in search of something that’s safe and easy to use? The JUUL starter kit is a device definitely worth considering. 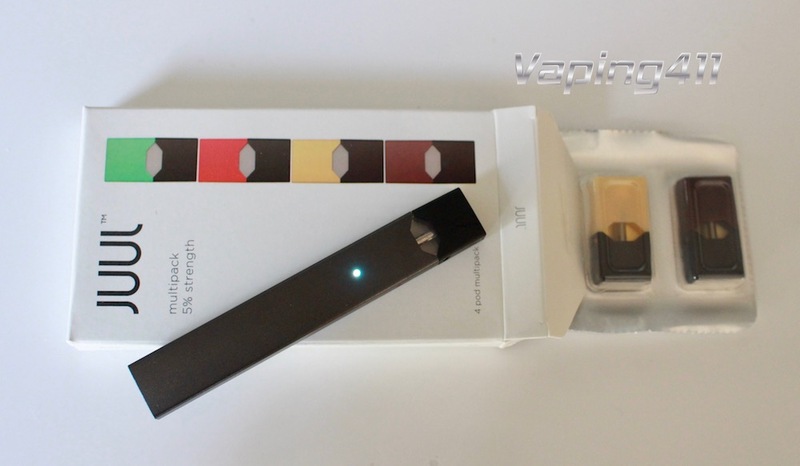 This sleek electronic cigarette is quickly earning a reputation as the ‘Apple of the e-cigarette industry.’ The JUUL sports a modern, eye-catching design paired with revolutionary technology. In depth review of the JUUL, pod flavors and battery. JUUL decided to take a risk and step away from the traditional design of an e-cigarette. Taking this risk is paying off because the JUUL is quickly growing in popularity. The thin, rectangular shape is lightweight and has a minimalistic design. There are no buttons to press, making it extremely easy to use and carry around. The JUUL Starter Kit comes with everything you need to start vaping. Sticking with the minimalistic trend, the packing of the JUUL is thin and keeps waste to a minimum. The packaging has two separate compartments to hold the actual e-cigarette and magnetic USB charger. The second compartment holds the pack of four flavor pods which contain the e Liquid. Most first-time users will look for a manual to help them operate the device. You won’t find a paper manual here, but none are needed. You won’t find an easier to use device than this. The JUUL has a small, stealthy, rectangular shape and can easily fit in your shirt pocket. The JUUL comes with everything the user needs to begin vaping. The starter pack is convenient because it’s not necessary to purchase a variety of different pieces. Everything comes together so one can start immediately. The nicotine content of each pod is 5% or 50 mg/ml. This is may be a drawback for some Vapers looking for less nicotine. JUUL uses nicotine salt in their ejuice. 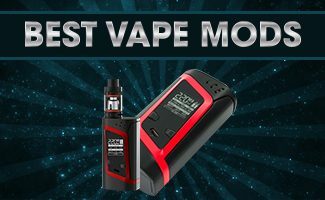 This is just an alternative way to add nicotine to eLiquid and many vapers find this method much more satisfying than the traditional freebase nicotine. The battery life of the JUUL is quite fair. With moderate use, it will last a user for about eight hours. During my testing of the device, I got about five hours of vaping before needing a recharge. But keep in mind I am a heavy vaper. Checking the battery level is easily done due to the integrated smart sensor. Simply quickly tap the device two times. If the battery is completely charged, a small LED indicator will light up green. Half of a charge remaining is indicated with a yellow light, and when the device is in need of a charge, it will indicate red. This simple, minimalist design is really helpful when monitoring battery usage throughout an extended period of time. When it’s time to recharge, simply plug the magnetic USB charger into any power source. 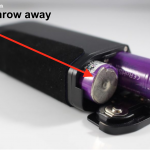 Snap the e-cigarette into the base, and the device will begin to charge. If the e-cigarette is completely dead, it will take about an hour to reach a full recharge. The first pod I tried was Menthol. 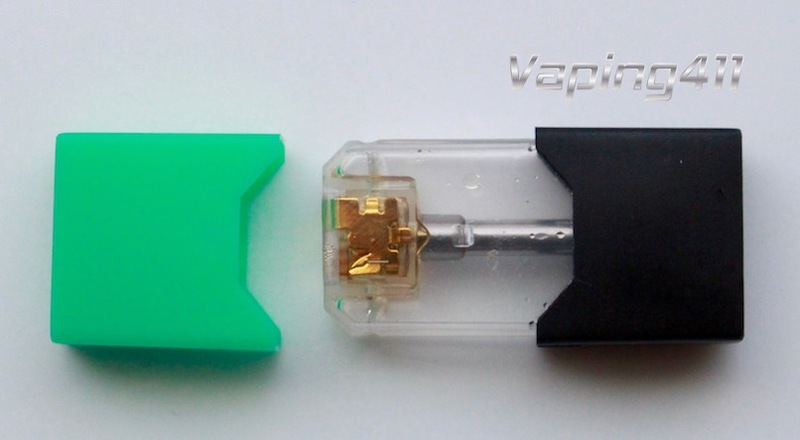 Here you can see the empty pod and the atomizer inside the cartridge. The green cover was placed beside the pod. To operate the JUUL, simply remove the colored cap and plug the pod into the vaporizer. These are specific to the JUUL, so do not attempt to use with a different device. This pod is also the mouthpiece that will be used to vape. There is no button on the device and it starts automatically when a draw is taken from the mouthpiece. To get started, the user must draw slowly to activate the device. 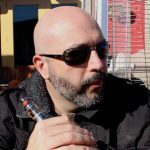 If the user is new to vaping, it’s best to do this slowly so they do not get a strong flavor right away. This is the only step required. The Juul is extremely simple and designed for ease of use! Each pod is the equivalent to one pack of cigarettes. A user should get 200 puffs before needing to replace a pod. With the JUUL pods, you have a choice of four out of five flavors: Bruule (creme brule), Tabaac (tobacco), Fruut (fruit cocktail), Mango and Mint (Menthol). As mentioned earlier, each of these pods contains 0.7 ml of e-juice with about 5% nicotine. Each pod is the equivalent of one pack of cigarettes and it will provide enough eLiquid for 200 puffs. The pods are currently being sold for $15.99 for a pack of four. This translates to $4.00 a pod. For bargain hunters, joining the Auto Ship Program will save you 15% on the pod purchases and get free shipping. 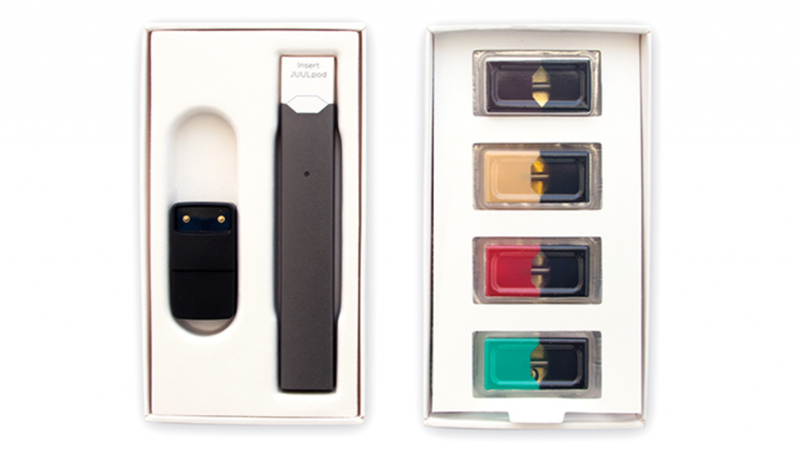 The JUUL Starter Kit comes with the JUUL and 4 eLiquid pods of various flavors. The Tabaac (tobacco) pod has a strong, natural tobacco flavor. Designed to give the user an authentic experience, the dry leaf aroma is obvious. This flavor is one to try if the user is in search of a more authentic tobacco experience. Creme Brule is a popular dessert choice so it’s no surprise that JUUL would work this into the Brule flavor. There is a strong, sweet vanilla custard taste that closely mimics creme Brule. For people with a sweet tooth, this flavor pod would be especially satisfying. Fruut is a basic, predictable fruit flavor. It’s slightly sweet with a bit of a citrusy finish on the exhale. It’s simple and not too bold or complex. For those who have enjoyed menthol cigarettes in the past or simply enjoy a strong mint flavor, the Mint pod can be a great option. The menthol is bold and refreshingly strong. This is a new flavor which was introduced after conducting this initial review. 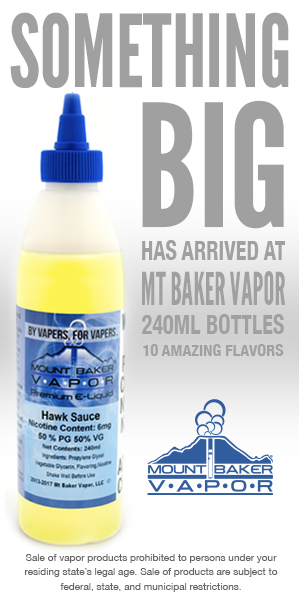 The flavor is described as mango with a hint of other tropical flavors. The JUUL Starter Kit is a great option for someone who is new to the e-cigarette world. It’s well made, simple to use and produces an excellent result. 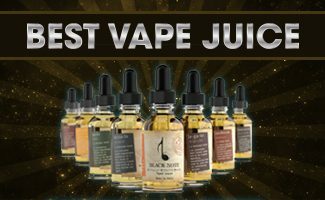 The JUUL is an extremely popular above ohm electronic cigarette that provides great throat hit, good vapor and no fuss eLiquid pods bursting with flavor. The only down side is that it is rather expensive. Each pod is the equivalent of one pack of cigarettes and costs $4.00.